Bugs and Insects! We use these terms interchangeably, though they are different! Bugs are one type of insect. True bugs, as they are called, have a straw-like mouth. Some true bugs are stinkbugs, assassin bugs and others. Ladybugs are NOT actually bugs! And spiders are neither bugs nor insects! However, all crawly things are bugs and insects and they are creepy and cool at the same time to preschool children! 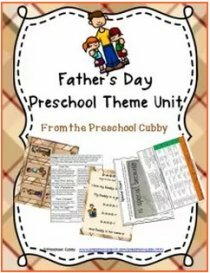 Imagine all the preschool lesson plans that can come from a preschool theme like this! One year, we decided it would be so cool to order ladybugs for the classroom! We would have them in our ladybug home, the children could observe them, journal about them, tell stories about them, etc. So, they were delivered. When we opened the bag, low and behold, lots of ladybugs started crawling out of the bag...so cool. Sadly, we found that half the ladybugs were, um, well, they didn't make the trip. We talked about that and then decided we should lay them to rest outside in the front garden/lawn area. We did so, had a moment of silence for the ladybugs and when back into our classroom. Two hours later, when the children were leaving, one of the parents commented on how Spring is definitely here. She could tell because of all the ladybugs outside today! Apparently, the ladybugs were in a cold, somewhat "hibernative" sleep from the way they are shipped! Moral of the story....let them warm up and wake up. They are not dead! Where can I find Ladybugs? This is the insect home we ordered. It comes with a coupon to order 15-20 Ladybug Larvae! This was awesome as we got to watch the entire life cycle unfold in our classroom! Ladybug Home AND Ladybug Larvae (the home comes with a coupon to order the larvae). Ladybug LARVAE ONLY. This is the tube with the larvae if you already have the ladybug home. Just want Ladybugs? Here are some options for ladybugs (no larvae) and homes! 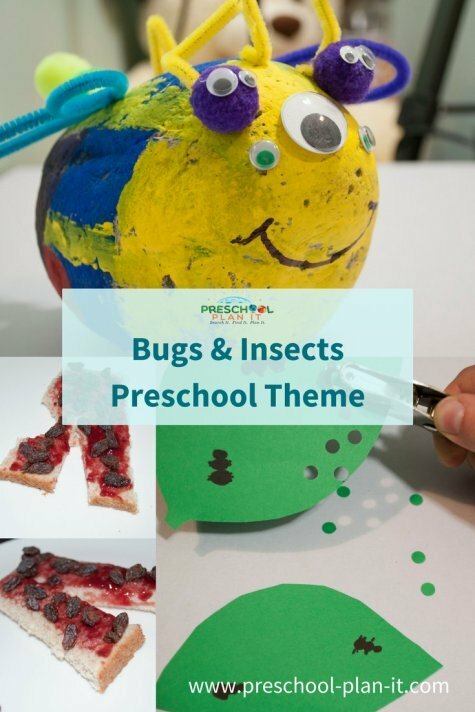 This Bugs and Insects Theme page is filled with preschool activities and ideas for all areas of your classroom. 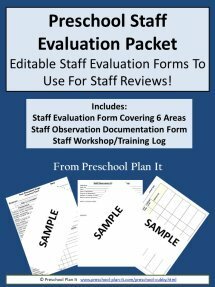 You can either scroll down through this page to see all of the preschool activities for your Bugs and Insects Theme or click the link below to go to specific preschool lesson plans you are looking for. Looking for a Caterpillars and Butterflies Theme? Materials Needed: spider stickers, blue or black paper, white crayons or white chalk. The children draw their own version of a spider web and then add spiders where they want them. Add bugs and insects stickers as well to "feed" the spiders! 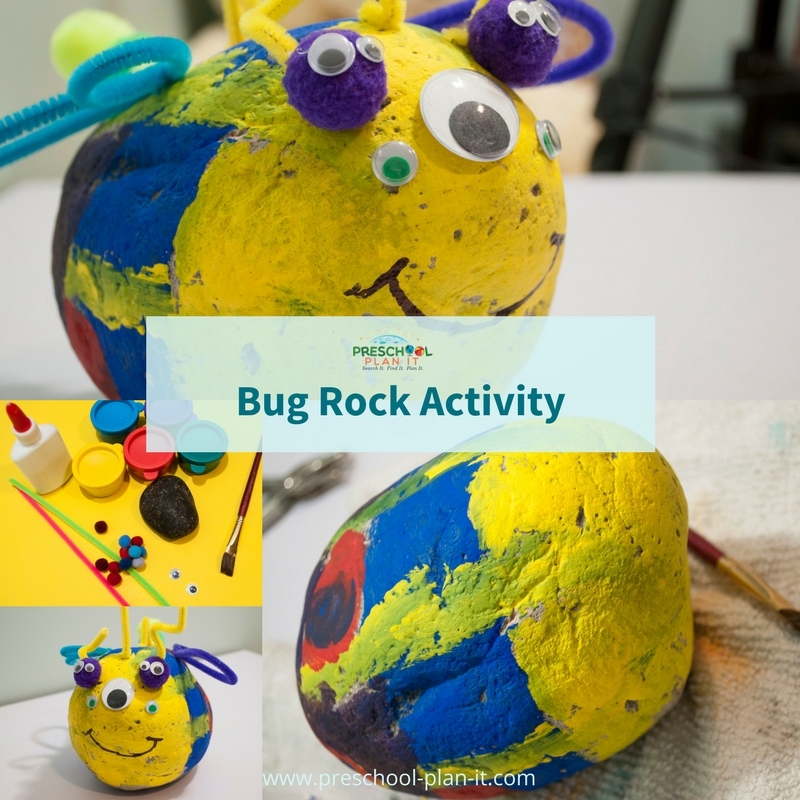 Let the children create their own pet bug rock! Crease the paper in half. Open paper up. The children make one handprint on the left side of the paper. Fold the paper closed and press. Open to reveal a mirrored image of their spider! When dry add googly eyes. 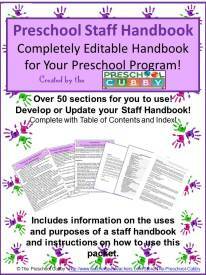 EXTENSION: After they have made one handprint, give them more paper to fingerpaint away! Add small stuffed bugs or bug puppets to your block area for the children to make homes for! There are so many choices of books and fingerplays for this theme. Many are listed below under the Library section on this page. Be sure to include lots and lots of non-fiction books. Show the pictures and talk about them as a group! Themed Snack Recipe Ideas to Cook Up! Cooking with children helps develop their math skills and helps them to learn how to follow directions. It also allows for some great conversation! Ask many questions while cooking with your children to encourage conversation! Be sure to ask specific Space theme questions while making these fun snacks! 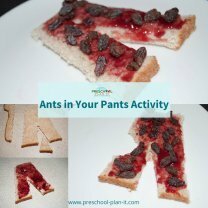 The children spread the bread and add raisin "ants" to their pants! Materials: Picnic basket, tablecloth or small blanket to have the picnic on; play food and plates and, of course, plastic bugs to interrupt the picnic with! Purchase or make different types of bug wings, and bug legs (use extra fabric to sew together and stuff for the kids to wear and have 6 legs like an insect!). Have the children paint using bugs instead of brushes! The yogurt sized lids should fit in your easel tray. Place stuffed animal type insects in the middle of the parachute to shake off! Vanessa's group places a stuffed grasshopper in. They have make the grass hopper "hop" by shaking the parachute and continue shaking until the grasshopper "hops" out! You can do the same with other stuffed insects you have: make the butterfly-fly the bee-buzz, etc.! Thanks Vanessa for this GREAT idea! Play this as you would the infamous Duck, Duck Goose Game! There are SO many books to choose from! Check out your local library and Don't Forget to get lots of non-fiction books so that the children can see real pictures as well! The books below can be purchased through Amazon also. The Itsy Bitsy Spider or any children's version! Bugs and Insects Theme activities to help your Preschoolers develop math skills and those small muscles in their hands! Use the stamps to stamp lots and lots of bugs and insects on the paper. The children take turns rolling the dice and coloring in that number of bugs. VARIATION: For individual counting, have each child make their own paper to work on! Materials: Green paper with leaf shapes drawn on them; scissors; hole punchers. The children cut out the leaves and then hole punch away! 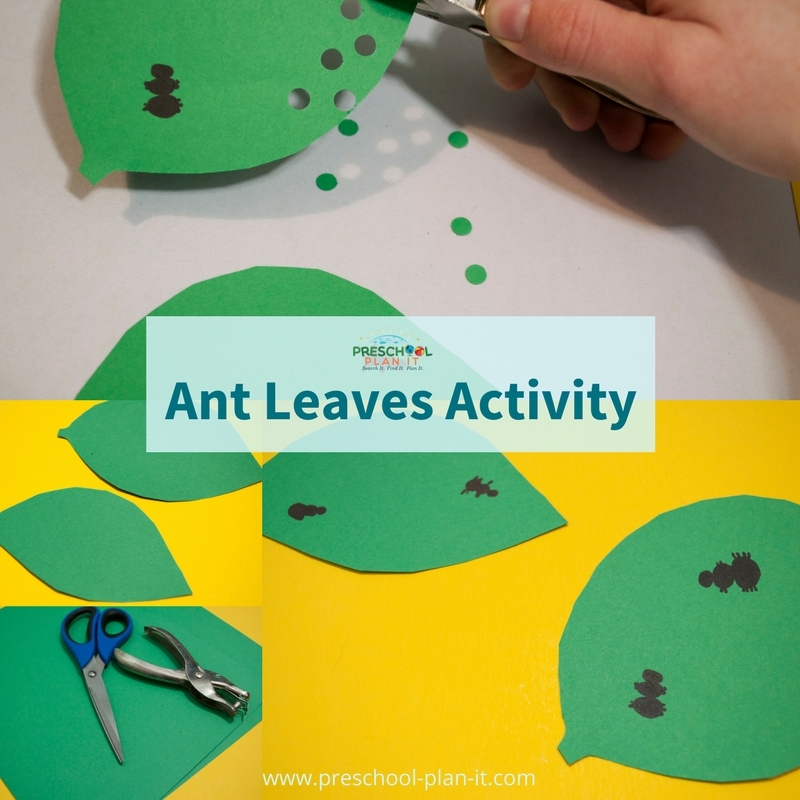 They can draw ants on the leaves (or give them stickers!) if they want. Great activity to get those muscles developed! 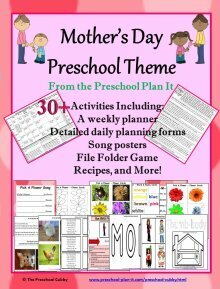 Bugs and Insects Theme Music and Movement Activities and Ideas to get your Preschoolers Movin' and Groovin'! Explain to the children that ladybugs are very helpful. They eat insects that may try ot eat or hurt our fruits and vegetables! Ladybug, ladybug...let me see you crawl! But be careful not to fall! See them crawl. See them crawl. Bugs, bugs, bugs! Bugs, bugs, bugs! And then it will buzz right out the door. When the bee is gone once more! Bugs and Insects Theme Activities for the Senses! Add plastic bugs and insects into your sensory table hidden in the sand with spoons and cups to catch them! Bugs and Insects Theme Science Activities--for your Preschool Scientists in Training! Materials: If you can find one, bring an old bee hive or nest into your classroom for the children to explore! Take a trip to a local pet store that sells bugs and insects as feed to check them out! Call a local farm to find out if they raise bees. 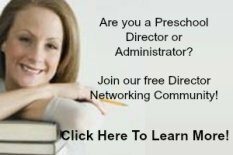 Can that person come in to your preschool classroom and talk to the preschoolers about bees? 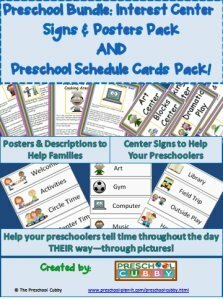 Writing Activity Ideas for Your Preschool Classroom's Bugs and Insects Theme! Encourage the children to draw a picture about bugs that bug them! They can print the names of their bugs, or you can help them do that!